Thank you for visiting www.Safemeds4all.com (the "Website"). PLEASE READ AND REVIEW THE FOLLOWING TERMS AND CONDITIONS OF USE AGREEMENT (the "Agreement") CAREFULLY BEFORE USING THE WEBSITE AND ANY ASSOCIATED SERVICES. By using the Website, you agree to be bound by the terms of this Agreement. If you do not agree with the terms of this Agreement, please immediately exit the Website and disregard the information contained herein. Asclepius universal Ltd., operating as Safemeds4all.com (collectively, "Safemeds4all"), reserves the right to change this Agreement, in whole or in part, at any time without prior notice to you. Accordingly, you should always review this page prior to using the Website and/or its related services in order to ensure that you understand the terms upon which you are permitted access. Safemeds4all reserves the right to correct any inaccuracies or typographical errors in the information posted on the Website, and shall have no liability for such inaccuracies or errors. Information may be changed or updated without notice and prices and availability of goods and services offered by the licensed pharmacies and/or government approved dispensing facilities engaged on your behalf by Safemeds4all (collectively, the "Pharmacy") are subject to change without notice. The Website (excluding linked websites, if any) is administered and controlled by Safemeds4all and its affiliates, subsidiaries, officers, directors, employees or agents, and their respective heirs, successors or assigns, from its offices in the accordance with the laws of Mauritius. You agree that this Agreement and use of the Website will be governed by and construed in accordance with Mauritius law, without giving effect to any principles of conflicts of laws. You have accessed the Website and/or its associated services at your own risk, and remain responsible for complying with the laws of the jurisdiction within which you are located. You agree that all disputes, controversies or claims arising out of or in connection with the Website shall be submitted to and be subject to the jurisdiction of Mauritius. You also agree and hereby submit to the exclusive jurisdiction Mauritius to finally adjudicate or determine any suit, action or proceeding arising out of or in connection with the Website and you do so voluntarily. As set out in greater detail below (see "Consequences"), Mauritius is the jurisdiction for any such suit, action or proceeding arising out of or in connection with the Website or this Agreement, such arbitration will be conducted in accordance with Mauritius Aribitration laws. For example, the Food and Drug Administration ("FDA") has taken the position that virtually all shipments of medications imported from a Pharmacy by a United States customer will violate United States law. By placing an order for medications or services, you represent to Safemeds4all and the Pharmacy, and you shall be responsible to ensure, that the sale, delivery and shipment of the medications will not violate any import, export or other law or regulation in your home jurisdiction. The Content does not constitute an offer or solicitation to buy or sell any medication, service or information to anyone in any jurisdiction in which an offer or solicitation is not authorized or cannot legally be made or to any person to whom it is unlawful to make an offer or solicitation. The terms and conditions applicable to any medication, service or information will be those determined at the time of providing the product, service or information. Please be aware of the laws of your jurisdiction or that otherwise apply to you in relation to any of the matters described in this Agreement. If you choose to access the Website from outside of Mauritius, you do so on your own initiative and you are responsible for compliance with applicable laws. You may not use or export or re-export the Content or any copy or adaptation in violation of any applicable laws or regulations, including export laws and regulations of Mauritius in force from time to time. The Website and its associated services are intended as a business and commercial entity, and are therefore not intended for use by persons under the age of majority in the jurisdiction in which they reside. The material on the Website is owned and licensed by Safemeds4all and is intended to be viewed by users in jurisdictions where the Content or the services offered would not violate any law or regulation. 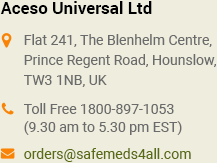 "Safemeds4all.com" is a registered trademark of Asclepius Universal Ltd., operating as Safemeds4all. All text, graphics, user interfaces, visual interfaces, photographs, trademarks, logos, sounds, music, artwork and computer code (collectively, the "Content"), including but not limited to the design, structure, selection, coordination, expression, "look and feel" and arrangement of such Content contained on the Website is owned, controlled or licensed by or to Safemeds4all and is protected by copyright, patent and trademark laws, and various other intellectual property rights and unfair competition laws. Except as expressly provided in this Agreement, no part of the Website and no Content may be copied, reproduced, republished, uploaded, posted, publicly displayed, encoded, translated, transmitted or distributed in any way (including "mirroring") to any other computer, server, website or other medium for publication or distribution or for any commercial enterprise, without Safemeds4all's express prior written consent. You hereby agree to indemnify and hold Safemeds4all and its subsidiaries, affiliates, officers, directors, agents, co-branders, partners, and employees harmless from any claim or demand, including reasonable attorney's fees, made by any third party due to or arising out of your use of the Content and/or the Website, or any content you submit, post, or transmit through the Website, your use of the Website, your connection to the Website, your violation of this Agreement, or your violation of any rights of another third party. Any unprotected e-mail communication over the Internet is, as with communication via any other medium (e.g. cellular phones, post office mail, etc. ), not confidential, subject to possible interception or loss, and/or to possible alteration. As a result, do not send anything that you deem to be confidential. Safemeds4all is not responsible for and will not be liable to you or anyone else for any damages in connection with an e-mail sent by you to Safemeds4all or an e-mail sent by Safemeds4all to you at your request. Links from or to websites outside the Website are meant for convenience only. Safemeds4all does not review, endorse, approve or control, and is not responsible for any websites linked from or to the Website, the content of those websites, the third parties named therein, or their products or services. Linking to any other website is at your sole risk and Safemeds4all will not be responsible or liable for any damages in connection therewith. Safemeds4all disclaims all warranties, express and/or implied as to the accuracy, validity and legality of any materials or information found on those websites. Links to downloadable software sites are for convenience only and Safemeds4all is not responsible or liable for any difficulties or consequences associated with downloading such software. Use of any downloaded software is governed by the terms of the license agreement, if any, which accompanies or is provided with the software. Reviewing the Website server logs and our customers' use of the Website helps us to statistically monitor how many people are using the Website and for what purpose. Only authorized Safemeds4all personnel and agents have access to the Website server logs, cookie utilization data, and purchase history information collected by Safemeds4all. These employees are held to strict confidentiality, security policies and procedures. The Website is generally available to users twenty-four (24) hours per day, seven (7) days per week, three hundred sixty-five (365) days per year. However, Safemeds4all retains the right to make the Website unavailable at any time, for any reason, and for any length of time. By using the Website you agree that Safemeds4all will not be liable for any damage arising out of or related to any such interruption, suspension, or termination of the Website and/or the services or products contained therein. Upon acceptance of the terms of this Agreement, Safemeds4all authorizes you to view the Content and the Website solely for your personal use. The material on the Website is intended solely for individuals enquiring about the products or services offered by the Pharmacy. If you are not accessing the Website for such purposes, you may not use the Website. For certainty, use by non-customers or non-potential customers, or the agents, attorneys and/or representatives of non-customers or non-potential customers is strictly prohibited. Safemeds4all PROVIDES CONTENT ON THE WEBSITE AS A SERVICE TO YOU. THE WEBSITE CANNOT AND DOES NOT CONTAIN INFORMATION ABOUT ALL MEDICAL CONDITIONS AND MAY NOT CONTAIN ALL INFORMATION THAT IS APPLICABLE TO YOUR PERSONAL CIRCUMSTANCES. THE WEBSITE IS NOT INTENDED FOR DIAGNOSIS AND SHOULD NOT BE USED AS A SUBSTITUTE FOR CONSULTATION WITH YOUR OWN PHYSICIAN. THE CONTENT OF THE WEBSITE, THE WEBSITE SERVER THAT MAKES IT AVAILABLE, AND THE SERVICES AND PRODUCTS OF Safemeds4all AND/OR THE PHARMACY, ARE PROVIDED ON AN "AS IS" AND "AS AVAILABLE" BASIS WITHOUT WARRANTY OF ANY KIND, WHETHER EXPRESS, IMPLIED OR STATUTORY. Safemeds4all EXPRESSLY DISCLAIMS LIABILITY FOR TECHNICAL FAILURES (INCLUDING HARDWARE OR SOFTWARE FAILURES), INCOMPLETE, SCRAMBLED OR DELAYED COMPUTER TRANSMISSIONS, AND/OR TECHNICAL INACCURACIES, AS WELL AS UNAUTHORIZED ACCESS OF USER TRANSMISSIONS BY THIRD PARTIES. FURTHER, Safemeds4all DOES NOT REPRESENT OR WARRANT THAT NO VIRUSES OR OTHER CONTAMINATING OR DESTRUCTIVE PROPERTIES WILL BE TRANSMITTED, OR THAT NO DAMAGE WILL OCCUR TO YOUR COMPUTER SYSTEM AS A RESULT OF ACCESSING THE WEBSITE. YOU HAVE SOLE RESPONSIBILITY FOR ADEQUATE PROTECTION AND BACKUP OF DATA AND/OR EQUIPMENT AND AGREE TO TAKE ALL PRECAUTIONS TO SCAN FOR COMPUTER VIRUSES OR OTHER DESTRUCTIVE PROPERTIES. BY YOUR USE OF THE WEBSITE, YOU ACKNOWLEDGE THAT SUCH USE IS AT YOUR OWN RISK, INCLUDING RESPONSIBILITY FOR ALL COSTS ASSOCIATED WITH ALL NECESSARY SERVICING OR REPAIRS OF ANY EQUIPMENT USED IN CONNECTION WITH YOUR ACCESSING THE WEBSITE. TO THE FULL EXTENT NOT PRECLUDED BY APPLICABLE LAW, Safemeds4all, ITS ADVISORS, SUPPLIERS, CONSULTANTS, OFFICERS, DIRECTORS, EMPLOYEES, AND THEIR RESPECTIVE SUCCESSORS AND ASSIGNS, DISCLAIM AND EXCLUDE ALL WARRANTIES WITH RESPECT TO ALL CONTENT, EXPRESS, IMPLIED OR STATUTORY. THIS DISCLAIMER INCLUDES, BUT IS NOT LIMITED TO, ANY AND ALL WARRANTIES OF MERCHANTABILITY, FITNESS FOR A PARTICULAR PURPOSE, AND NON-INFRINGEMENT. Safemeds4all DOES NOT WARRANT THE CONTENT TO BE ACCURATE, COMPLETE OR CURRENT. Safemeds4all DOES NOT WARRANT THAT THIS WEBSITE WILL OPERATE WITHOUT ERROR, THAT DEFECTS WILL BE CORRECTED OR THAT THE WEBSITE OR THE WEBSITE SERVER MAKING IT AVAILABLE ARE FREE OF VIRUSES OR OTHER HARMFUL COMPONENTS. PRICE AND AVAILABILITY CONTENT, AS WELL AS OTHER CONTENT CONTAINED IN THE WEBSITE OR ACCESSIBLE THEREFROM, IS SUBJECT TO CHANGE WITHOUT NOTICE. YOU ACKNOWLEDGE AND AGREE THAT Safemeds4all DOES NOT ENDORSE THE CONTENT OF ANY WEBSITE ACCESSED VIA LINKS OR OTHER MEANS FROM THIS WEBSITE AND THAT IT IS NOT RESPONSIBLE OR LIABLE FOR ANY SUCH CONTENT (EVEN THOUGH IT MAY BE UNLAWFUL, HARASSING, LIBELOUS, PRIVACY INVADING, ABUSIVE, THREATENING, HARMFUL, OBSCENE, OR OTHERWISE OBJECTIONABLE, OR THAT IT INFRINGES OR MAY INFRINGE THE INTELLECTUAL PROPERTY OR OTHER RIGHTS OF ANOTHER PERSON). THE WEBSITE INCLUDES CONTENT PROVIDED BY THIRD PARTIES AND YOU. Safemeds4all IS A DISTRIBUTOR OF SUCH CONTENT AND NOT ITS PUBLISHER. Safemeds4all'S EDITORIAL CONTROL OF SUCH CONTENT IS THE SAME AS THAT OF A PUBLIC LIBRARY OR NEWSSTAND. Safemeds4all'S THIRD PARTY SUPPLIERS MAY EXPRESS CERTAIN OPINIONS OR PROVIDE CERTAIN INFORMATION AND OFFERS. HOWEVER, Safemeds4all MAKES NO WARRANTIES AS TO THE COMPLETENESS, ACCURACY, TIMELINESS, OR RELIABILITY OF INFORMATION OR OFFERS SUPPLIED BY THESE THIRD PARTIES. Safemeds4all DOES NOT GUARANTEE OR WARRANT THE PERFORMANCE OF ANY THIRD PARTY, INCLUDING ANY SUCH THIRD PARTY'S CONFORMANCE TO ANY LAW, RULE, REGULATION OR POLICY. Safemeds4all DOES NOT WARRANT THAT INFORMATION, SERVICES AND PRODUCTS SET OUR ON THE WEBSITE WILL SATISFY YOUR REQUIREMENTS OR THAT THEY ARE ERROR OR DEFECT-FREE. BEFORE USING ANY PRODUCT YOU SHOULD CONFIRM ANY INFORMATION OF IMPORTANCE TO YOU ON THE PRODUCT PACKAGING. YOU ASSUME RESPONSIBILITY FOR THE ACCURACY, APPROPRIATENESS AND LEGALITY OF ANY INFORMATION YOU SUPPLY Safemeds4all. THE WEBSITE IS OPERATED IN Mauritius AND Safemeds4all MAKES NO WARRANTY OR REPRESENTATION THAT ITS CONTENT IS APPLICABLE OR APPROPRIATE FOR USE IN OTHER JURISDICTIONS. AS PARTIAL CONSIDERATION FOR YOUR ACCESS TO THE WEBSITE, AND USE OF ITS CONTENT, YOU AGREE THAT Safemeds4all IS NOT LIABLE TO YOU IN ANY MANNER WHATSOEVER FOR DECISIONS YOU MAY MAKE OR YOUR ACTIONS OR NON-ACTIONS IN RELIANCE UPON THE CONTENT AND/OR OTHER INFORMATION ON THE WEBSITE. YOU ALSO AGREE THAT THE AGGREGATE LIABILITY OF Safemeds4all ARISING FROM OR RELATED TO YOUR USE AND ACCESS, REGARDLESS OF THE FORM OF ACTION OR CLAIM (FOR EXAMPLE, CONTRACT, WARRANTY, TORT, NEGLIGENCE, STRICT LIABILITY, PROFESSIONAL MALPRACTICE, FRAUD, OR OTHER BASES FOR CLAIMS), IS LIMITED TO THE PURCHASE PRICE OF ANY ITEMS YOU PURCHASED FROM THE PHARMACY VIA Safemeds4all IN THE APPLICABLE TRANSACTION. Safemeds4all AND THE PHARMACY SHALL NOT IN ANY CASE BE LIABLE FOR ANY DIRECT, INDIRECT, SPECIAL, INCIDENTAL, CONSEQUENTIAL OR PUNITIVE DAMAGES, EVEN IF Safemeds4all HAS BEEN ADVISED OF THE POSSIBILITY OF SUCH DAMAGES. THIS IS A COMPREHENSIVE LIMITATION OF LIABILITY THAT APPLIES TO ALL LOSES AND DAMAGES OF ANY KIND. IF YOU ARE DISSATISFIED WITH THE WEBSITE OR ITS CONTENT (INCLUDING THIS AGREEMENT), YOUR SOLE EXCLUSIVE REMEDY IS TO DISCONTINUE USING THE WEBSITE. Safemeds4all and users of the Website are independent contractors, and no agency, partnership, employment or other relationship is created or is intended to be created by use of the Website. The prices for the products and services on the Website are quoted, for convenience, in United States dollars, and may be quoted in Canadian dollars or other currencies as set forth on the Website as at the time of acceptance of an order by the Pharmacy. Prices for products may be subject to change without notice. Credit terms are within the Pharmacy's sole discretion, and unless otherwise specified in the invoice, payment must be received prior to the PharmacyÃ¢â‚¬s acceptance of an order. Safemeds4all reserves the right to suspend or terminate your account if you violate this Agreement. If your violation causes harm to others, you agree to indemnify and hold Safemeds4all harmless from and against any and all loss, damage, or expense. If any dispute arises between us regarding this Agreement or your use of the Website, it shall be resolved through good faith negotiations between the parties. If such good faith negotiations prove unsuccessful, all such controversies, claims, or disputes shall be submitted to binding arbitration in Mauritius, but heard pursuant to the law and regulations of the Province of Manitoba. More specifically, although Mauritius will be the venue for the arbitration, it shall be conducted in accordance with The Arbitration Act (Manitoba), C.C.S.M. c. A120, as amended. The arbitration award shall be final and binding, and it may be confirmed and enforced in any court of competent jurisdiction. Each party shall pay for all attorney fees it incurred in connection with the arbitration and shall share equally in the costs of the arbitration. This Agreement, and any terms incorporated or referred to herein, constitute the entire agreement between Safemeds4all and you relating to your use of the Website and the subject matter therein, and supersede any prior understandings or agreements (whether electronic, oral or written) regarding the subject matter, and may not be amended or modified except in writing, or by Safemeds4all making such amendments or modifications in accordance with this Agreement. Safemeds4all shall not be liable for any delay or failure in performance caused by circumstances beyond its reasonable control, including, without limitation, delays due to backorders of requested products, mail delays, customs delays or lost shipments. Safemeds4all shall not be responsible to notify you in the event of such delays. You shall be solely responsible to make other arrangements to purchase alternative products and any costs incurred in connection with such purchases, if necessary.